We repair all makes of car, motorbike and light commercial vehicle from replacing tyres to full engine rebuilds, no job is too small or large. All our work is carried out according to the Government backed Motor Industry Code of Practice and we are also part of the Good Garage Scheme so you can be sure that everything is done to the highest standard. Our fully equipped workshop enables us to carry out any repair and the latest diagnostic equipment allows us to diagnose even the most complicated faults. Booking is not always necessary and we can often do repairs while you wait. Unfortunately every vehicle is different so we are not able to give a price list here but we will be glad to give a quote over the phone. We are able to carry out tyre replacement and wheel balancing for cars, bikes and vans, please call for pricing. £45.00 labour to replace chain and sprockets (parts extra). £45.00 per calliper to replace brake pads (parts and labour). 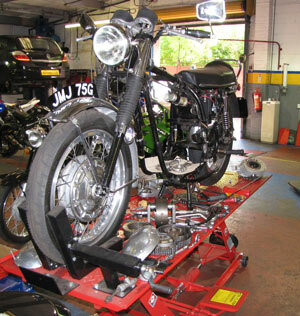 We also operate a recovery service for cars and motorbikes.